Showing the steam carriages Autopsy, Era and Infant. 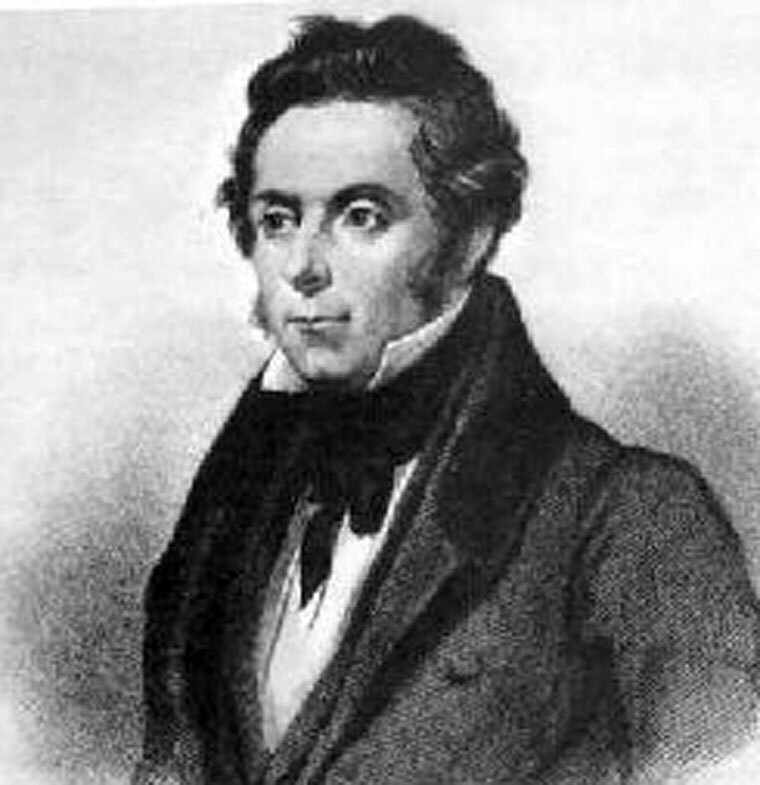 Walter Hancock (1799-1852) of High Road, Stratford, Essex was a builder of steam powered road vehicles. 1799 June 16th. Born at Marlborough, Wiltshire the sixth son of James Hancock, a timber merchant and cabinet-maker at Marlborough, Wiltshire. Between 1824 and 1836, Hancock constructed at his Stratford works in East London a number of steam road vehicles, one of these being a three-wheeled four-seater car. 1827 Hancock also patented a steam boiler that would split rather than blow so that the passengers being carried on his steam vehicles would be able to travel in safety. In 1829 he built a small ten-seater bus called the Infant, with which in 1831 he began a regular service between Stratford and London. It was powered by an oscillating engine carried on an outrigger behind the back axle. The boiler was vertical and made up of a series of narrow parallel water chambers. A fire was situated beneath the boiler and the fire was fanned by bellows worked by the engine. There was a hopper to feed in the coke. This vehicle was made famous by its later revenue-earning journeys from London to Brighton, which were a British first, and also demonstrated its usability by successfully ascending a frozen slope of 5 degrees where horse-drawn coaches were struggling. The vehicle was ultimately lost in an accident when the driver blocked the safety valve in order to increase the starting pressure and the boiler exploded. On the 31st of October, 1832, the Infant took an experimental trip to Brighton, which was documented in Mr. Alexander Garden's "Journal of Elemental Locomotion". 1833 April 22nd. Hancock’s steam omnibus the Enterprise (built for the London and Paddington Steam Carriage Co) began a regular service between London Wall and Paddington via Islington. It was the first regular steam carriage service, and was the first mechanically propelled vehicle specially designed for omnibus work to be operated. The engine worked on a crank and iron chains applied the power to the back wheels. The service was brought to an end due to a dispute between Hancock and the operators, and Hancock himself built and operated further steam buses between 1833 and 1840. 1833 Introduced the Autopsy a smaller vehicle. 1833 September 11th. Commences to Brighton with the 'Infant' carrying six passengers. 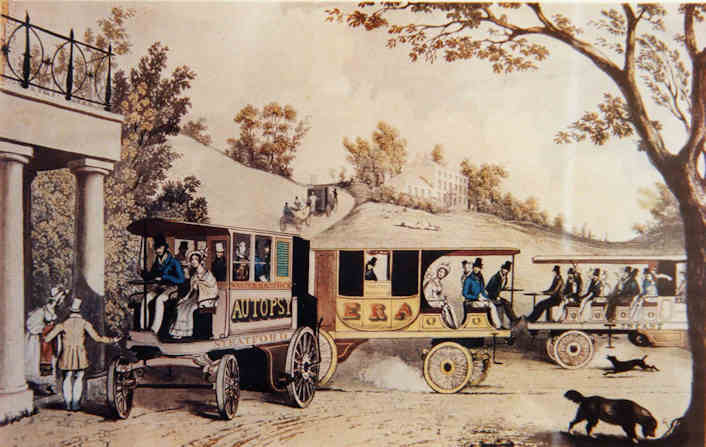 1836 Introduced the 22-seat 'Automaton', a 22-seater powered by a two-cylinder engine with a bore of 9in. and a stroke of 12in and rated at 24hp at 70 RPM. It proceeded to run over 700 journeys between London and Paddington, London and Islington, and Moorgate and Stratford, carrying over 12,000 passengers in total and regularly travelling at speeds in excess of 20 mph. By 1840, however, the development of steam-powered road vehicles had lost impetus and the heavy road tolls imposed by the Turnpike Acts had turned inventors away from steam. Hancock was forced to give up the struggle, and the way was left clear for the operators of horse buses. 1840 Hancock continued working with steam and supplied a light engine (similar to his steam road coaches) to the Eastern Counties Railway. The boiler consisted of separate chambers which greatly reduced the risk of explosion. This page was last edited on 13 February 2018, at 07:14.